Swimming, tennis, exercise classes and unlimited use of the gym… YMCA St Paul’s Group has got everything you need for an active, fun-filled summer. Cool down on a hot summer’s day in the Hampton Open Air Pool, or challenge a friend to a set of tennis at YMCA Hawker. Children and young people aged 4 to 14 will love the TNT sessions at Hampton Pool every Tuesday and Thursday, and teenagers aged 13 – 16 get discounted memberships in our gyms. There’s nowhere better to enjoy the summer months than in or by the magnificent 36 metre tiled Hampton Open Air Pool, where the water is maintained to a temperature of around 28 degrees all year round. For opening times and prices, visit the Pool’s website. From 21 July until 27 August, Hampton Pool hosts a series of 12 summer ‘TNT sessions’ open to all children aged between 4 and 14 years. The fun-filled action runs for two hours on Tuesdays and Thursdays between 09.30am and 11.30am. Activities include climbing on an enormous 17 metre inflatable; enjoying the bouncy castle; giant aqua run; parachute; walking on water; and much more. Fully trained staff are always present and keeping an eye of the children, taking care of all your children’s needs. Each session costs £16 which includes a snack of freshly prepared fruit and squash from our Sun Deck Café before the second hour of fun commences. To book a place for your child at this summer’s TNT sessions at Hampton Pool, download a booking form, fill in and hand it in at Reception at Hampton Pool, along with your payment. 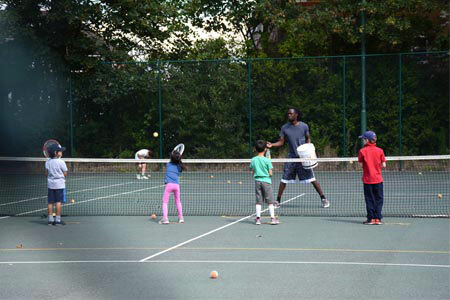 YMCA Hawker offers tennis courses and sessions for new and experienced players of all ages and levels. Why not take the opportunity to schedule in some friendly matches with your friends this summer? Subject to availability, our courts are available for public hire for £5 per hour (£3 for juniors). From Monday 20 July until the end of August, Jeremy and Nick will be holding weekly tennis courses for children aged 4-11+. Bored and looking for something to do this summer? Too young to join a gym? As a member of our Club 13-16, you can work out for only £3.30 per session at any of our gyms in Wimbledon, Kingston or Surbiton. To find out more, call in at your local YMCA LSW centre or call 020 8296 9747 for YMCA Hawker; 020 8390 0148 for YMCA Surbiton; and 020 8542 9055 for YMCA Wimbledon.